This article was written By Matthew Hardstaff on 04 Oct 2015, and is filed under Reviews. 10 years ago I was lucky enough to see SPL at the Toronto International Film Festival with Sammo Hung, Wilson Yip and Wong Jing in attendance. It was a special night for me not only because I got to see kung fu legend Sammo Hung in the flesh, but also because the film itself was a truly mind blowing experience. It not only featured some incredible martial arts action, but became the first showcase of Donnie Yen’s MMA infused kung fu action choreography and it left you feeling like Yen (or Sammo Hung for that matter, your choice) had punched you in the gut. In short, it was everything you could ever want out of a modern day martial arts epic. Fast-forward 10 years and again, at TIFF, I’m lucky enough to see SPL 2: A Time for Consequences, this time with director Soi Cheang and producer Paco Wong in attendance. While not completely a sequel in name only (I’ll elaborate shortly), SPL 2 has no connection with SPL. This time around, Wu Jing plays Kit, an undercover cop whose also developed a drug addiction as part of his cover. His uncle and coincidentally police superior Wah (Simon Yam) has him deep undercover investigating an organ trafficking crime syndicate headed by the chronically ill Mr. Hung, (Louis Koo), who also happens to have a congenital heart condition. Hung is desperately in need of a heart transplant but has a super rare blood type, so his only recourse is to kidnap his own brother so he can remove his heart for a transplant. When the kidnapping attempt on his brother goes sour, Kit’s cover is blown, and he’s sent to a prison in Thailand that’s in league with Hung. Meanwhile, Wah is keeping Hung’s brother as leverage. While in prison, Kit meets Chai (Tony Jaa), a prison guard who has a daughter with leukaemia. He’s taken the job at the prison to raise money for her bone marrow transplant as her time is running out. As things start to slowly unravel, all the players meet up in Thailand and engage in plenty of double crossing and martial arts mayhem! As stated above, whilst SPL 2 has no narrative connection to SPL, it is still more than a sequel in name. SPL stands for Sha Po Lang, three words derived from Chinese astrology with each representing a star that is capable of good or evil, depending on its position in the sky, and in both films, the protagonists operate in the same manor in order to protect the young girl at the centre of each film. They are both very similar in tone, share some of the same actors and both feature some bone crunching action choreography. 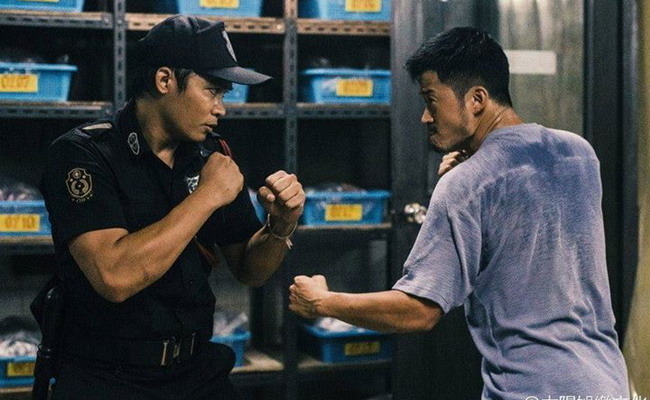 SPL 2 also features several nods to the first film, borrowing a few musical cues, and also having a reversal of the now classic Donnie Yen/Wu Jing alley fight, this time with Wu Jing wielding the baton and his opponent wielding the knife. Cinematically, however, SPL 2 takes it to places its predecessor could only dream. If we forget for a moment that Soi Cheang made the abysmal The Monkey King (2014), his last few efforts, Motorway (2012) and Accident (2009), were outstanding cinematic achievements, and he really raises the bar here. He creates some brilliant moments of tension and then unleashes some truly outstanding action set pieces, rivalling anything in recent memory. There is a prison riot scene that features some incredible long takes, the camera fluidly travelling between floors whilst capturing some ridiculous stunt work and action insanity that’s truly a cinematic spectacle. It’s on par with the long take prison riot from The Raid 2 (2014). The finale is an absolutely jaw dropping martial arts set piece, which show cases not only Tony Jaa and Wu Jing’s physical prowess, but really allows relative newcomer Zhang Jin to almost steal the show. As the Thai prison warden, he plays much of the film as a vicious but unassuming character, but as things gradually escalate, he unleashes his martial fury and when the credits roll you’ll be asking yourself who the hell is this guy and where did he come from. I’m heaping a ton of praise on the film, which to be fair is completely justified, but it does have its shortcomings. Unlike its predecessor, it does lack the emotional punch to the stomach that SPL left you with. Its tone through out leads you to believe its heading in a similar nihilistic direction, but then the films final minutes pull a 360 and opt for a more cliché, heart warming ending which I could have really done without as the final moments really do feel forced and tacked on. And whereas in SPL the meaning of the title applied not just to the protagonists, but also to some of the antagonists, particularly Sammo Hung’s character, here its strictly the protagonists who hover between good and evil. Here we are given one dimensional bad guys with no redeeming qualities, which only adds to the lack of emotional catharsis. But despite a flimsy final 5 minutes, SPL 2 is a superb martial arts extravaganza that is without a doubt one of this year’s best action films.